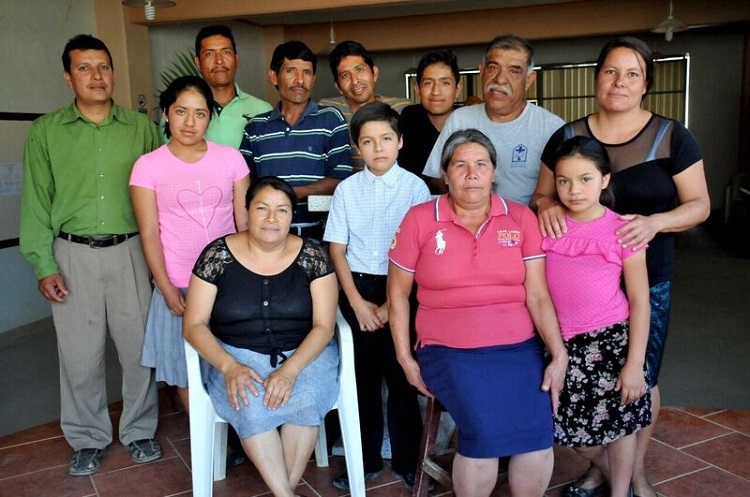 Some of the current and former members of the Evangelical church in San Juan Ozolotepec, including Alonso Silva (top centre), who was forced to leave, and Guadalupe Aragon Reyes (far right), who followed him. As many as 90% of Mexico’s population would identify as Christian, yet not all of them are free to practise their faith. Some come under pressure from drug cartels, either by being members of churches who meet regularly and carry money for giving offerings there and are therefore seen as easy targets, or because of the ways in which they put their faith into practice and how this sets them up against the ambitions of the cartels. For others, such as converts from indigenous communities, the pressure comes as a result of their refusal to continue to participate in the same religious, social and cultural activities as the rest of their community. In places like Tuxpan de Bolaños in the western state of Jalisco, some of the converts who refused to participate in tribal religious rituals and sacrifices, or offer money towards them, were forced out of the town. 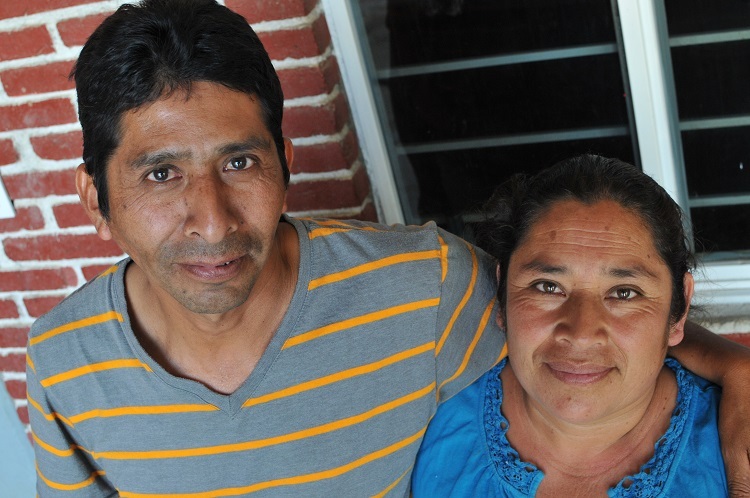 In other communities, such as the town of San Juan Ozolotepec in the southern state of Oaxaca, converts are targeted by people who at first glance would seem to be fellow Christians. The vast majority of the people of San Juan would say they are Catholics, though the reality is more nuanced, as Dennis Petri, Latin American analyst for Christian charity Open Doors, explains. In San Juan, as in Tuxpan, some of those who now call themselves “Evangelical” Christians have been evicted from their community. One of them, the leader of the group, Alonso Silva, 43, was badly beaten and then imprisoned alongside other converts, while his house, car, and the church building the converts had recently finished constructing, were all demolished. Mr. Silva and his wife and three children now live in a town just outside the state capital, four-and-a-half hours from San Juan. They are forbidden from returning home. Alonso Silva and his wife Silvia. Some members of his congregation have followed him, choosing to turn their backs on a town in which they were regularly insulted or subjected to discrimination. Children were bullied at school; adults found they were no longer permitted to buy things from local stores. One woman who followed the Silvas out of San Juan, Guadalupe Aragon Reyes, 36, told World Watch Monitor that the mob who arrested Mr. Silva also arrested her and her husband, and that they attempted to rip the clothes from her back. Despite the difficulties the converts have continued to face, around 50 of the group have remained, though they say they continue to feel abandoned by the local authorities – and even several of the faith-based organisations that have visited the area. World Watch Monitor asked the state government if it wished to comment on the situation but received no reply. Open Doors’ Petri added that the state police is “too far away and too ill-equipped to be able to protect these people”. Mrs Reyes, speaking on behalf of the group, said: “We would love for things to be resolved there, but we do not know how, because we can’t make the people understand that people should be free to choose the faith they want to follow. They close their minds and can’t understand that we can be free, we can decide our faith. They want to force us to be who they are, to do what they do, what they practise. We decided to separate and get away from the things they do – their traditions, their religious customs – and that’s what bothers them. Petri told World Watch Monitor that the state government, “and in many cases the federal government”, has failed to properly document the case as a “convenient way for them to ignore the problem and not to act upon it”. The Inter-American Human Rights Commission has repeatedly reprimanded the Mexican State for not fulfilling its duty to document cases of human-rights violations, he added. Petri added that the issue is political as much as it is religious. However, he said that any debate about the root of the problem is less important than working towards a solution. “To one degree, you could interpret the building and opening of a church in a rural community as just believers exercising their right to freedom of religious expression, or freedom of worship, but in the context of those communities the church building is also a symbol that directly threatens the moral authority of the local leaders,” he said. “A church building therefore is not just a house of prayer, but also it’s a political statement of subversion and people are indirectly saying, even subconsciously, that they no longer submit to the authority of the community and also refuse to take part in the rituals and other traditions of the community. He challenged the Mexican government and judiciary to do more, and also the Catholic Church. A complicating factor in San Juan, as in Tuxpan and other indigenous communities, is the government’s constitutional requirement to protect the traditions – or “uses and customs” – of the ancient communities. As such, a certain level of autonomy has been granted to each community, whereby they can appoint their own local leaders, even if they are still, officially at least, beholden to the state authorities and its laws on respecting religious freedom, and human rights in general.